I keep it in my office at the University of Toronto (Scarborough). Students and some (younger) faculty look at it with curiosity. And sometimes with suspicion. They approach it cautiously, asking how it works. Some are even nervous about touching it. I put a sheet of paper in the roll and invite them to try it out. Often they recoil after punching in a letter. Being used to the gentle typing touch of computer, they are appalled at how typing is/was such a physical effort. "It's so loud," they say. "And heavy!" I bought it in a London pawnshop in 1974 after my flat had been burgled. They took my old Smith-Corona Selectric while I was in the middle of finishing my thesis. The replacement Olivetti that I found cost £8, and turns out to be a rare find. First mass produced in Italy in the early 1950s, it is an example of post-war modernist design. One of the originals now resides in the Museum of Modern Art (MOMA) in New York. Yesterday, the university held its annual open house for prospective students and their parent. On the Journalism display table, I put a number of books, mementos and various newsroom tshotshkes I've collected over the years. 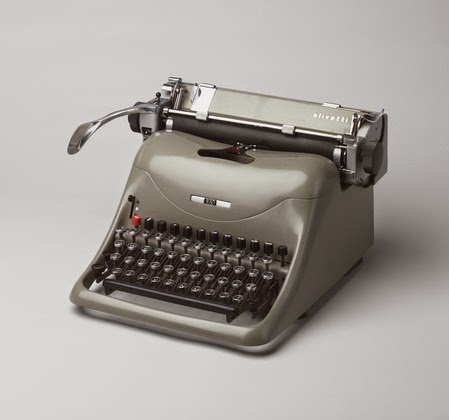 I also lugged the Olivetti down and invited people to try it. (Full disclosure - my typewriter was not a typical newsroom machine. In TV news, we used teleprompter typewriters which produced a large print format. But the memory of banging away at a typewriter on deadline, brings back the noise of a more industrial-era newsroom: the rattle of the typewriters, the noise of teletypes - even behind thick baffles - combined with the thick blue air of dozens of cigarettes and the yelling of impatient editors are gone in today's more refined and restrained newsrooms). The high school students who came by to ask about our journalism program were indeed, fascinated by the Olivetti. We invited them to give it a try. Like others, they were wary at first, then enthusiastic pounders! Some questions: how would you know when you are about to run out of space? They were also fascinated by the little bell that rings to warn you you are coming to the end of the line. What if you want to double space? How do you make a capital letter? Where does the ink come from? What if you make a mistake? Don't your wrists get tired? Did I really write a thesis on this? My own Olivetti got dragged around as I moved back to North America after finishing my degree to different jobs in Montreal, Toronto, Washington then back to Toronto. The machine didn't age well and for years, it sat in a box in the basement. Then I found a young man in Toronto who repairs and these antiques. For about $80, he restored the typewriter to perfect working condition. It now sits in my office as a reminder of those pre-digital times of great student days and simpler technologies. As I explain to my students, it's just an earlier version of an app. They understand that instinctively.